A little bar recently opened up around the corner from my house called Opera Bob’s Public House. This is definitely going to be my new local for the summer. Drinks are cheap, there’s a tight little pub grub menu, and the bartender/owner we had was both interesting and funny (and it was his first shift ever bartending!) When asked by my roommate what the patrons have been like, the guy told us that it’s neither the Ossington hipsters nor the Dundas crazies. Sounds good to me! They play sports on the tvs, which will include UFC once they get the go-ahead from the pay-per-view people. The front window rolls up like a garage door, and it’s nearly directly across the street from Trinity Bellwoods Park, so it’ll be a great place to get a BEvERage following an intense tennis match or a lazy day in the sun. This place kind of reminds me of the bar from the FX tv show It’s Always Sunny in Philadelphia, mostly because it’s owned by 4 dudes and the one serving us was pretty hilarious. If you haven’t seen this show yet, here’s a clip. For some reason, embedding of these previews has been disabled, so you’ll have to click on the url . 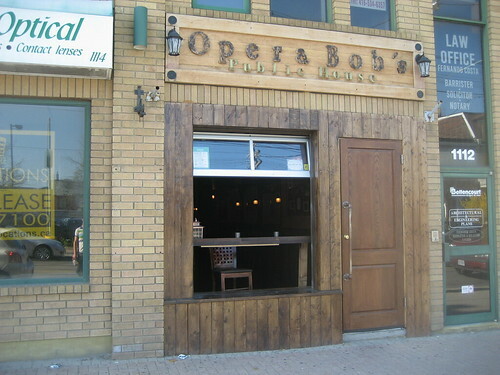 . .
Opera Bob’s Public House is located at 1112 Dundas Street West. It’s open daily, from 5pm – 2am.